This old-fashioned dessert recipe came from a neighbor with a persimmon tree, via another neighbor who whipped it up and brought me a taste. The flavors are of late fall. Like Edna Lewis' version of Persimmon Pudding, this dessert is essentially a steamed, dense cake along the lines of a Christmas pudding. The instructions here call for a jury-rigged version of a pudding mold, but you could also use a snaplock pudding mold. Or simply follow the second set of cooking instructions and bake the pudding in a dish inside a water bath. Halve the persimmons. With a spoon, scrape the soft pulp from the skins. Mash the pulp with a fork or your fingers. In a large bowl, cream together the sugar, butter, and vanilla. Mix in the purée and the eggs. In another bowl, combine the flour, baking soda, salt, cinnamon, and nutmeg; stir them into the butter mixture. Add the nuts, raisins, and brandy, if using. Cooking instructions, version 1: Butter a standard-size Bundt pan and fill it two-thirds full with batter. Cover tightly with foil. Place a cake rack on the bottom of a large stockpot; pour boiling water into the pot and set the Bundt pan in the stockpot so that the water comes two-thirds up the sides of the Bundt pan. Cover the pot and simmer very gently for 2½ hours, adding more water as needed. When the pudding is set, carefully remove the Bundt pan and let cool before removing pudding. Cooking instructions, version 2: Preheat the oven to 400 degrees. Butter an 8-by-12-inch baking dish. Scrape the batter into the dish and place it in a larger baking dish. Put the stacked dishes into the preheated oven and pour boiling water into the larger dish so that the water comes two-thirds up the sides of the inner baking dish. Bake for 35 to 45 minutes, or until the pudding is a deep brown and a toothpick inserted in the middle comes out moist but clean. 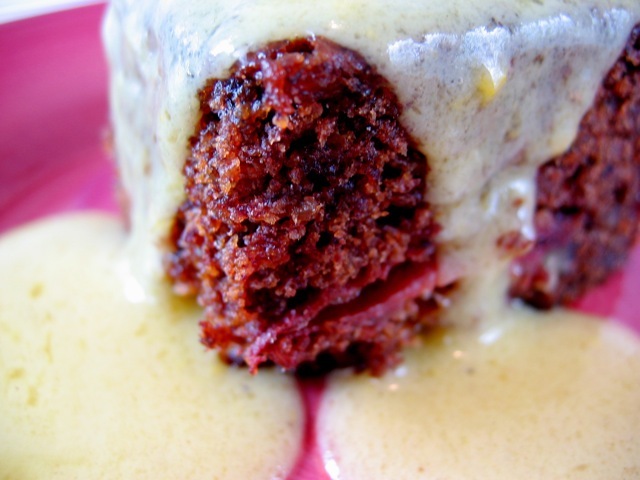 Serve with whipped cream, if you like, although a more traditional sauce would be Crème Anglaise or Whiskey Sauce.